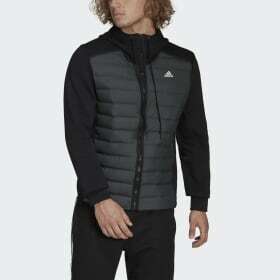 Be your best this winter and keep the adventure flowing with the luxurious range of adidas winter jackets for men. From classic puffer jackets to stylish modern sports jackets, the adidas winter jacket collection brings you the best of street style and elemental protection. With a range of styles and designs to choose from, and sizes from XS to 2XL available - finding your perfect jacket is a breeze. We’ve designed a range of coats and jackets for street wear and sport wear to give you the perfect balance between practicality and style. Lifestyle – the lifestyle range brings you modern and classic street style brimming with comfort. Comfortable down chambers and lightweight hoods keep you at your best all winter. - Outdoor – Outdoor jackets with soft Conextbaffles down chambers or Climawarm overlapping chambers and durable water repellent coatings keep you warm and dry as you brave the elements. - Winter sports – Hit the slopes or get out in the winter cold with a durable winter sports jacket from adidas. Lightweight designs, down chambers and Climaheat technology will keep you super warm and dry in the coldest weather. - Golf – Golf jackets with extra stretch and water-resistant materials give you the agility and warmth to keep your eye on the ball. - Skateboarding – Kick flip your way through the winter with lightweight skateboarding jackets designed to keep you cool and dry as you skate. - Training – Winter training jackets keep you warm pre and post-game with effortless style, long cut designs and warming padded insulation. adidas winter jackets for men give you effortless style and warm winter comfort whether you are out on the pitch or out on the town.